Once a staple of the Jeep line-up, the Jeep Cherokee XJ is a dying breed. Nearly three million Cherokees have been sold, with model years ranging from 1984 to 2001. That’s a staggering run for any automotive platform, rendering the XJ ubiquitous across North America. In its prime, it filled all of the roles: a workhorse, a toy, and even a status symbol. Fast forward to today. A large number of Cherokees are still around, but that number has dwindled. Those that survived Cash for Clunkers have been scooped up by younger drivers, not known to be preservationists, due to their affordability and ease of service. The XJs that dot the road today are shadows of their former selves, like fallen kings, ousted from their thrones in the name of progress. It has been heralded as a “future classic”, but how long will it be until the Cherokee is once again revered as an icon, and acknowledged with more than a sideways glance? 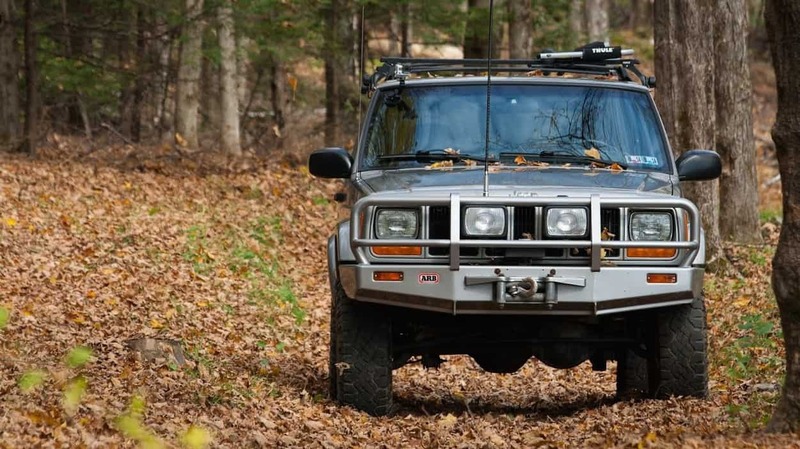 As a recreational off-roader is where the Jeep Cherokee XJ shines. It’s inexpensive, there is still fantastic aftermarket support, and there’s no shortage of spares in North America. It has a proper front axle, its wheelbase is “just right”, and its overall size is well-suited for overgrown two-tracks and winding switchbacks. With minimal modification, its off-road prowess is second to none. Like most Jeep vehicles, the Cherokee is a blank canvas; an Erector Set, and can be configured to fill nearly any role. 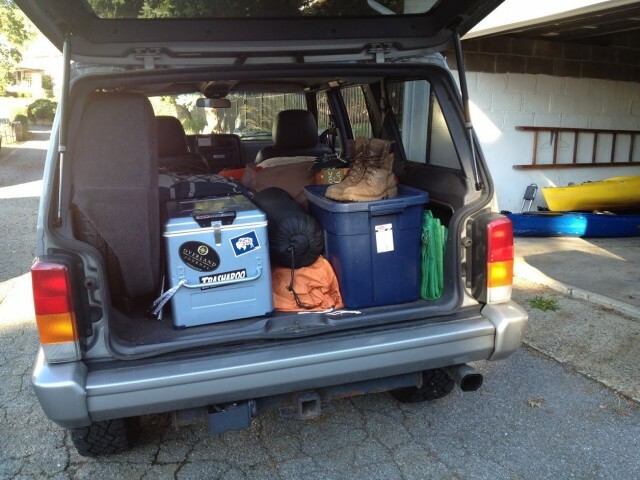 As an overland vehicle, the Cherokee possesses a few shortcomings which make it less than ideal as a world traveler. First, spare parts become more difficult to find overseas. 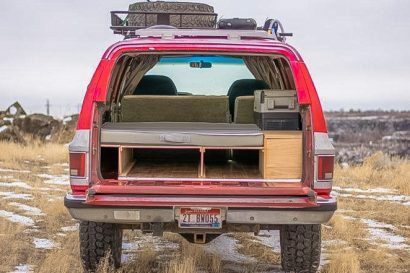 Second, it’s a small, relatively lightweight SUV that wasn’t built to support a very large payload, which is often a prerequisite for long-distance overland travel. Finally, the remaining XJs are at least 14 years old. The Cherokee is built on a steel uni-frame, although proven in the field, once this skeleton begins to deteriorate due to corrosion or arduous use, you aren’t left with much of a salvageable vehicle. Despite these shortcomings, I am from the school of thought that any vehicle can be an overland vehicle. To wax poetic, it’s not a make, model, or modification that makes your vehicle a good overland vehicle, it’s the exhilaration you feel when you sit down behind the steering wheel with your eyes set upon the horizon. 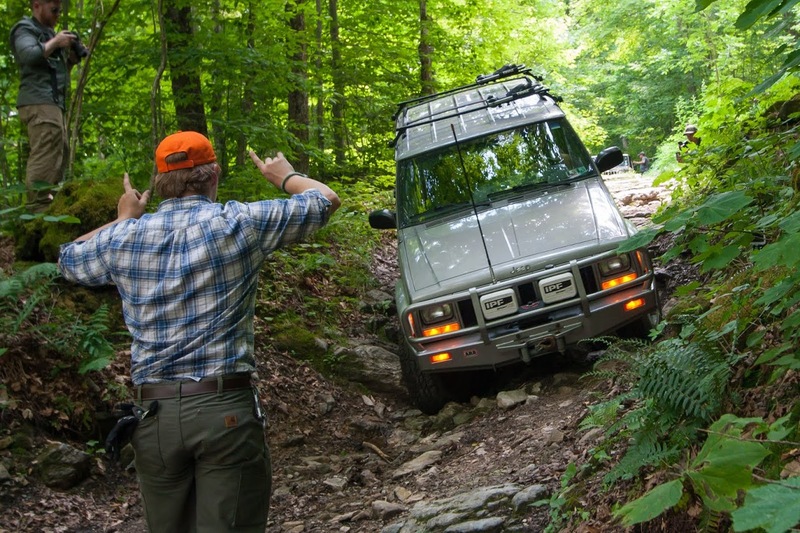 Your own spirit of adventure is the common defining feature of an overland vehicle, and the vehicle itself is just a tool that serves to both move and inspire. 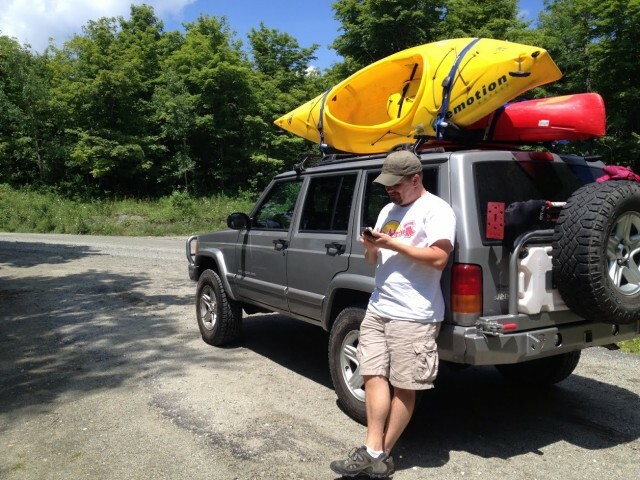 My own adventure-mobile is a 2001 Jeep Cherokee Limited. Purchased with 22,000 miles on the odometer in 2005, it’s only “Limited” in wheels and monochrome trim, and possesses none of the other fanciful features often associated with the Limited marque. It has cloth seats, no ABS, no premium sound; its a bit of a curiosity in that sense, but I rather appreciate the stark simplicity in contrast with the elegant outward appearance. It is a theme that I’ve strived to maintain over the years – simply functional, yet elegant. That’s a fine line to walk in a Jeep, because once you deviate from that factory, pavement-biased formula, you’re almost always compromising comfort. Nevertheless, I set out to outfit the Cherokee for all driving conditions. The suspension system is made by Old Man Emu. It nets a roughly two inch increase over the factory ride height, nicely accommodating 245/75R16 tires on the factory 16″ rims. The suspension was purchased in 2003 and consists of model 930 coils and light-duty, JC1B, rear leaf spring packs. 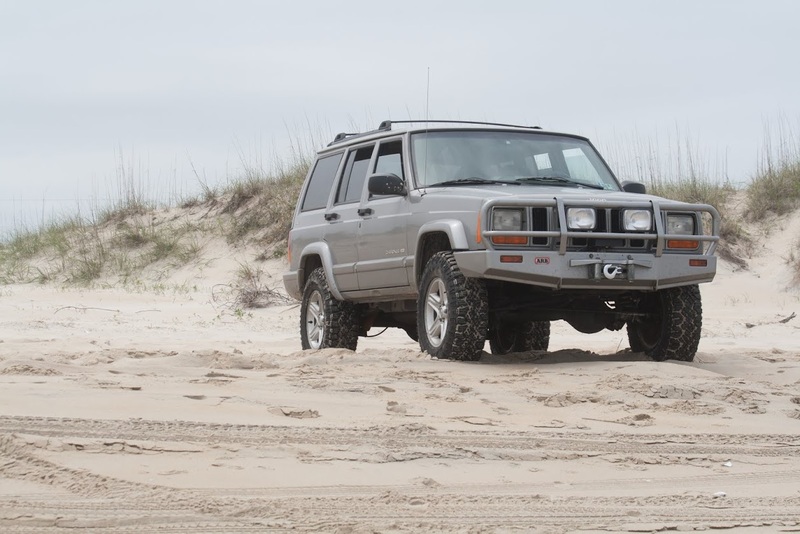 When the suspension was purchased, the Cherokee was not equipped with heavy aftermarket bumpers, which is why light-duty components were selected. At the time, they provided ample support for myself and my gear. Old Man Emu add-a-leafs were recently added to improve support for the rear bumper and tire carrier, and generous 1.75″ coil spacers were installed in the front to compensate for the heavy winch bumper. This suspension system has been absolutely superb. Despite being marginally overloaded, I can detect no fatigue even after almost 10 years of heavy use. To ensure that the Cherokee’s driveline was geometrically sound, I installed a fixed-yoke conversion in the NP231 transfer case, and installed a Tom Wood double-cardan rear driveshaft. I recently upgraded the worn, factory front driveshaft with a custom shaft from Quigley Motor Company, a well-known manufacturer of four-wheel drive conversion vans. 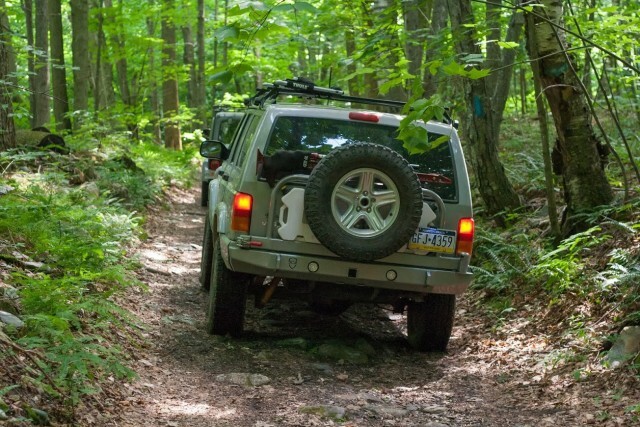 When it comes to minimizing noise, vibration, and harshness, it has been an uphill battle to find a set of off-road capable tires that I’ve been happy with. 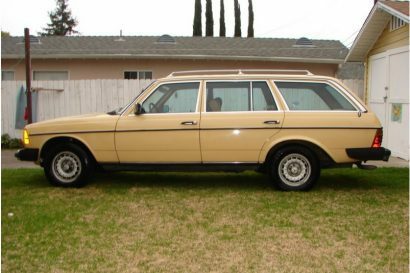 I first started with a set of BFGoodrich All-Terrains. These tires are well-proven, and are almost certainly the most recognizable in the world of all-terrain tires. Overall traction was good, and tread-life was decent. However, these were only available in an extremely rigid 10-ply load rating (E), which was a little too firm for my relatively light Jeep Cherokee, resulting in a significant increase in harshness. Second, I tried a set of Goodyear Duratracs, which is an all-terrain with profound shoulder lugs and a very aggressive tread pattern. This tire was available in a much softer 6-ply configuration (Load Rating C), which reduced a lot of the harshness. Traction, durability, and longevity of the Duratracs was decent, but what the tire lacked in harshness, it more than made up for in noise. I found this to be an unrefined and ill-mannered tire. If you’re a weekend off-roader, it might suit you well, but if you’re an overland traveller, you should consider other options. I’m currently running a set of 6-ply (Load Rating C) Cooper Discoverer AT3 all-terrain tires, and I love them. This choice was influenced by this [https://expeditionportal.com/cooper-discoverer-a-t3/] article on Expedition Portal. They’re whisper quiet, very comfortable on the road, and they’re seemingly durable and very effective on the trail. The jury is still out, as I’m only few thousand miles into them, but I’m already extremely fond of them. This is the most pleasant my Cherokee has been to drive in years. 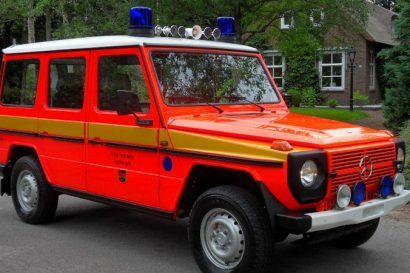 The front bumper is an ARB Bull-Bar, housing a Warn M8000 winch, and IPF 800XS driving lights. While I don’t usually indulge in non-functional vehicle dress, I opted to have the bull-bar painted to conform to the Limited’s monochrome theme. This was just a minor touch to help preserve the Cherokee’s factory appearance. 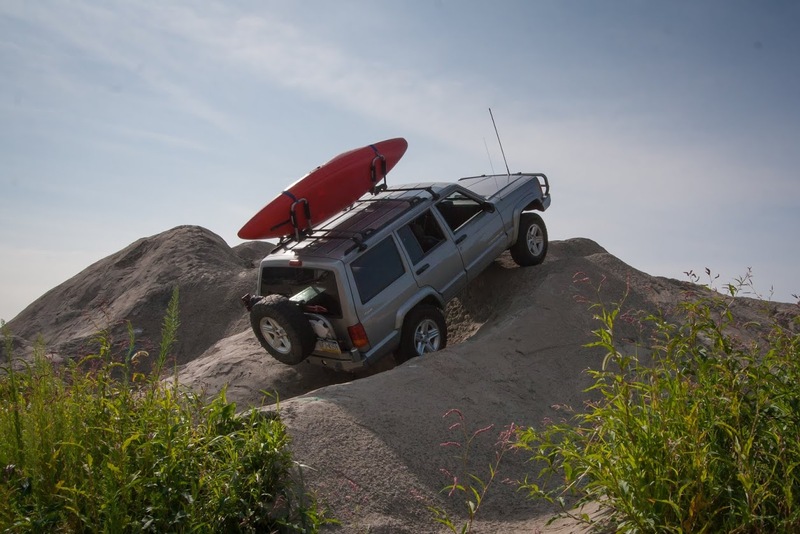 The rear bumper and tire carrier is made by JCR, a Michigan-based company that still actively engineers new, high-quality bumpers and armor for the XJ platform. It consists of corner armor, integrated LED reverse lights, and a swing-away arm which accommodates a 48″ Hi-Lift Jack, two 5-gallon Rotopax containers, and a spare tire. Mounting the spare on the outside freed a considerable amount of interior space for gear, and also allowed fitment of a full-size spare tire, which I’ve risked driving without for far too long. This bumper and tire carrier assembly was also color-matched to complete the motif. The Cherokee is also equipped with a 12-volt, ARB Fridge-Freezer, purchased around the turn of the century, when the ARB Fridge-Freezers were re-branded Engel units. My fridge is approximately 14 years old, and is perhaps the most reliable piece of kit that I’ve ever owned. Despite looking a little rough around the edges, it still functions as if new, and is an invaluable part of any trip. For navigation, I have a Garmin 276C Chartplotter GPS connected to a MacBook Pro mounted on a RAM laptop pedestal. The Garmin GPS is hard-wired to 12-volt power, and has an external antenna located on the ARB Bull-Bar. The software I’m running on the Mac allows the user to import and calibrate raster topographical maps, with which you can then use to track your position in real-time. While this setup looks fairly high-tech, and is extremely accurate, it has quickly become antiquated. The Garmin 276C, although still very useful for tracking your position, is otherwise obsolete and has been discontinued by Garmin. 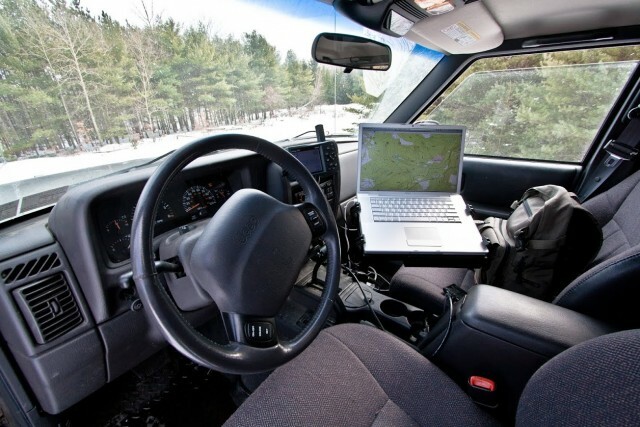 The same functionality that is gained by connecting a GPS to a laptop computer can now be had using a small GPS enabled tablet. For music and voice-guided navigation, the head unit has been replaced by a blank switch panel. Behind the switch panel is a small, four-channel amplifier connected to a marine Bluetooth dongle. The stereo is, essentially, always on and is controlled exclusively by my smartphone, which is mounted on the switch panel with RAM hardware. For all intents and purposes, it’s a stealth stereo system and has been a bit of a do-it-yourself project. Sound quality and convenience are both adequate, but there is room for improvement. Ownership of this Jeep Cherokee hasn’t been smooth-sailing. I’ve owned five Jeep Cherokee XJs in the last 22 years, and while my experiences have been generally positive, this one has been the least reliable. The more prominent issues have been “heat soak”, which is radiant heat from the exhaust manifold causing fuel to evaporate in the delivery system. I lost air conditioning for a while, which was a costly repair. The cooling system has been replaced, and the heater core leaked coolant inside the cabin, causing noxious fumes which I inhaled for roughly a week. Finally, the venerable 4.0L engine developed a severe rod knock at 148,000 miles and needed to be replaced. The Jeep tests me sometimes, but I love it, so I persevere. Right now, it’s running better than ever. Plans include a transfer case upgrade, optimized gear ratios, selectable lockers in the front and rear differentials, synthetic winch rope, an air-compressor, and perhaps even a raised air intake. Of course there will be no end to tweaks and minor refinements, but I expect this to be the extent of any significant, future modifications. I’m proud of my Cherokee, even though ownership has been wrought with ups and downs. With it, I’ve explored the remote beaches of North Carolina, the wild and wonderful West Virginia wilderness, the Pennsylvania coal regions, and the Green Mountains of Vermont – and I have no intention of stopping there. 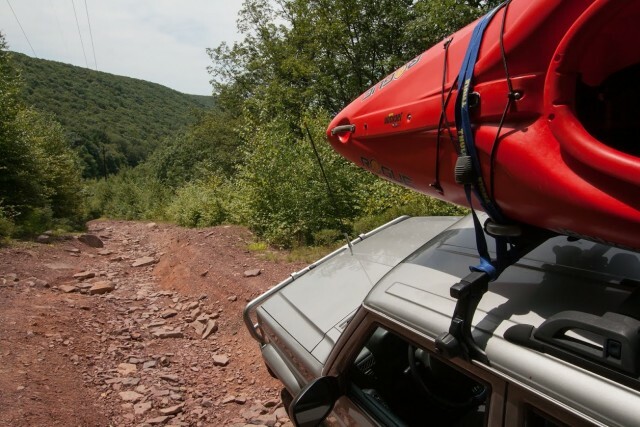 To me, it isn’t as much about the vehicle as it is about the adventure, and I regard my Cherokee as my personal, cherished key to unlocking amazing new experiences.